FanDuel is one of the two main providers for Daily Fantasy Sports. They offer contests from all the major sports like NFL, MLB, NBA, NHL, PGA, and other popular sports leagues. FanDuel is one of the main Daily Fantasy Sports providers in the US. 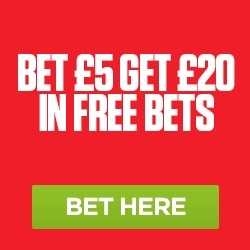 They have been around for years and have a reliable track record with payouts and promotions. If you are new to Daily Fantasy Sports, it is similar to Fantasy Sports League that you may have joined with friends and coworkers. The only difference is that a contest is 1-day/1-week long (depending on the sport), while the old school Fantasy Leagues were a season long. Enjoy the freedom of drafting new for every contest, not need to be stuck with same team that may be going nowhere. Daily Fantasy Sports allows you to play when you want, take a break when you want or draft how you want. Unlike old school Fantasy Leagues, you are often penalized for not changing your roster one day or the uncontrollable circumstances of injuries or trades. Daily Fantasy Sports is new challenge everyday, giving you a fresh start and chance to use working knowledge for the current sports season. 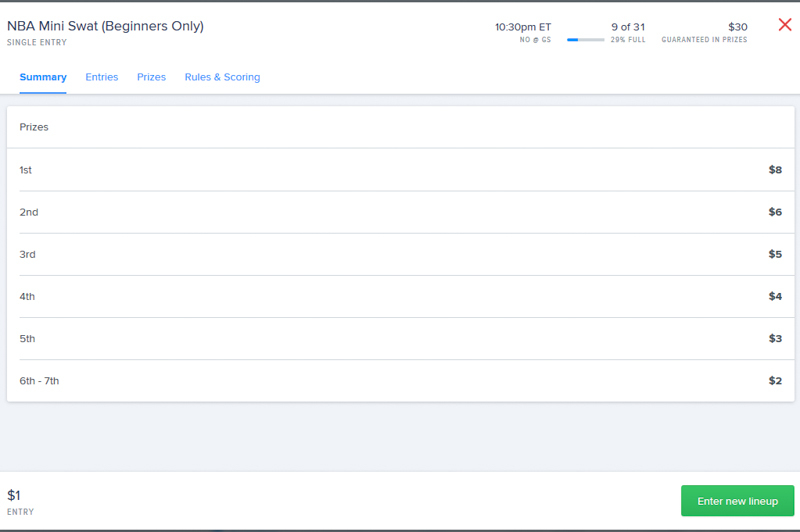 Now that you got an idea of what Daily Fantasy Sports is, we will go over how to play and how it works at FanDuel. 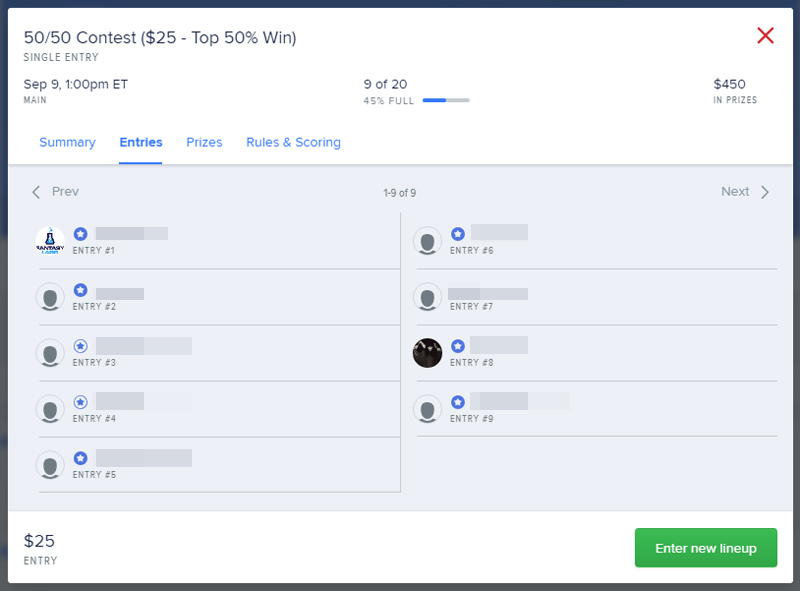 One the best things about FanDuel is that their website and mobile apps make it easy to join a contest or edit your line up. Whether you’re at home, work, vacation or commuting, it’s pretty simple once you learn the basics. 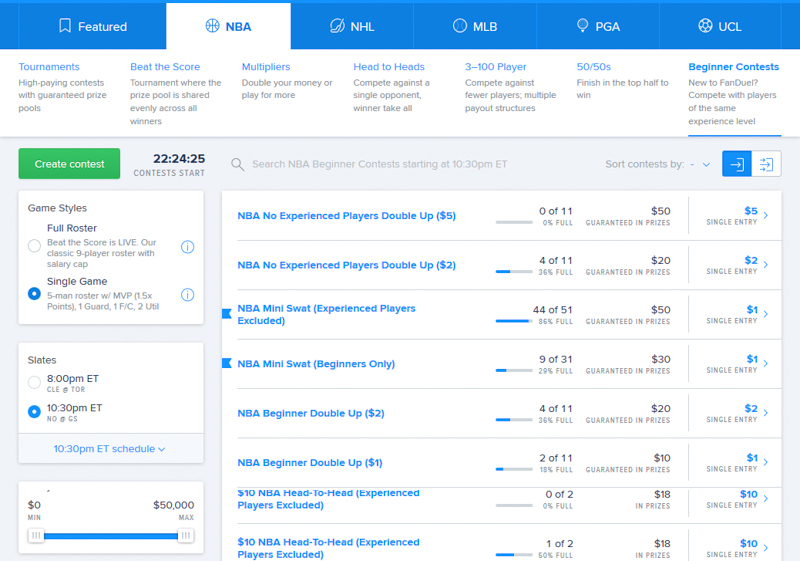 FanDuel concentrates on the main sports league like NFL, NBA, MLB and other sports. In all sports they often offer big tournaments and promotions. Here is a list of the sports leagues currently offered at FanDuel. Within each sports, there are different contest types. A contest type will dictate the scoring style and the way the cash prizes are divided. As you play more, you will find a specific contest type you prefer to play. Tournaments are contests with the biggest guaranteed prizes and sometimes the biggest amount of entrants, but not always. Some of the tournament contests will be satellites to bigger contests. The total guaranteed prize will usually be shown in the contests title. Beat The Score are contests where you need to get a score past the threshold. The score to beat will usually be shown in the contests title. Multipliers are contests where you can double your money, all the way up to 5x your entry fee. The multiplier will usually be shown in the contests title. Head to Heads are contest where you compete against one opponent. Win and you take home all the money and all the glory. The opponent will usually be shown in the contests title. 3-100 Players are smaller size contests with differing payout structures. The number of contestants and sometimes the numbers of winners will usually be shown in the contests title. 50/50s are contest where you just need to finish in the top 50% to win a cash prize. Beginners Only are contests meant for new users, where you will compete against players of similar skill level. Satellites & Qualifiers are contests that get you into bigger bigger tournaments. When you win the contest, it is for a ticket to a larger prize tournament. Sometimes satellite contests will be for a different sport, like a MLB Satellite contest to an “NFL Sunday Million” Tournament. Friends Mode allow you to create a league to play with your friends or coworkers. 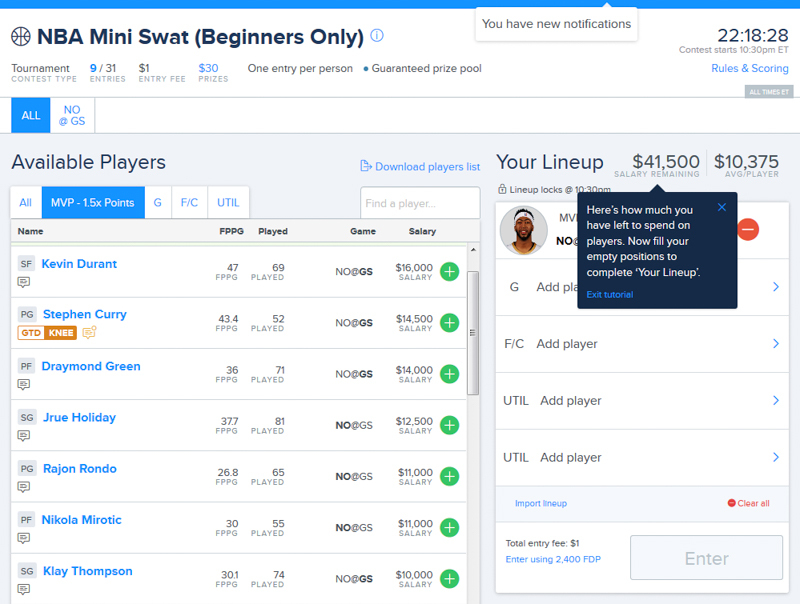 This is similar to the classic style of Fantasy Sports League. It’s easy to create a League. All you need to do is pick the sport, invite your friends, pick the duration, set the prize pool payout. Contest Style is basically the type of rosters you will use for the contest. Some people prefer specific styles, so after time you can also filter by style. Full Roster contests are similar to the classic style of fantasy sports where you pick players by positions and stay under a salary cap. The roster size varies by sport and you will be able to pick players from a specific game set. When you click on the contests “Summary” it will show all games available. This mean your player pool is only players from these games. Single Game contests are slightly different because instead of choosing from a game set of multiple games, there is only one game to choose from and it will be displayed in the contest title. This means your pool of players is only from the two teams competing in that game. Also for Single Game contests, you will roster sizes is usually 5 players based on positions. There is also a salary cap that varies by sport. Quick Pick contests is basically a tier system where you select the player you expect to score the most in each tier. No need to calculate their costs, just pick your player. The amount of tiers varies by sports. Also of note, is that this style in not available in all sports. 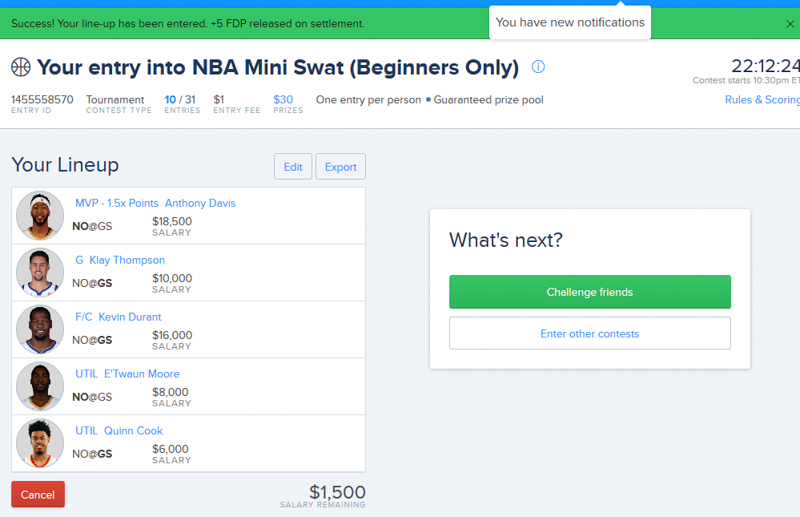 At times, FanDuel offers a new style of contests. Sometimes they test in one sport before offering in others. So make sure to check the available game styles to see what is available. Currently in MLB, there is a Home Run Challenge game style where you pick 3 hitters with the goal to have the highest number of home runs. 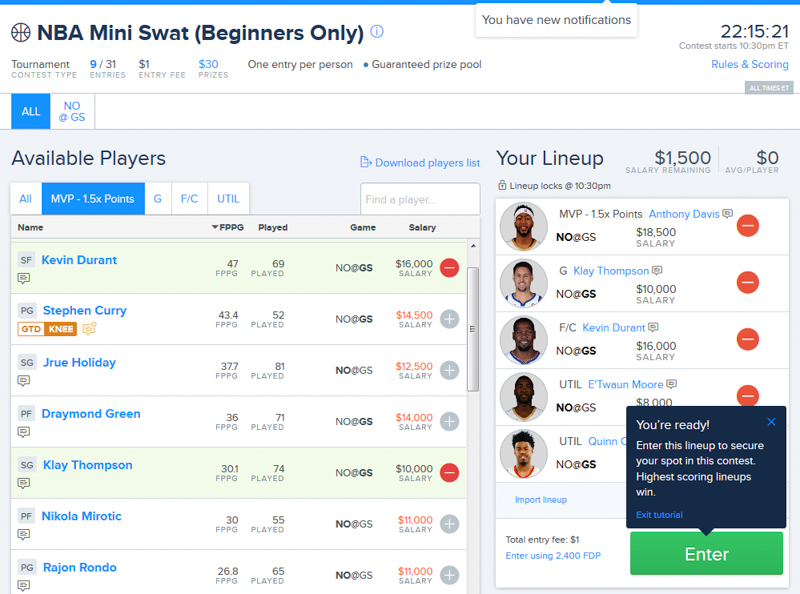 FanDuel has worked on improving its way of classifying users based on their experience. The experience level is divided into 4 groups: Beginner, Intermediate, Experienced and Highly Experienced. 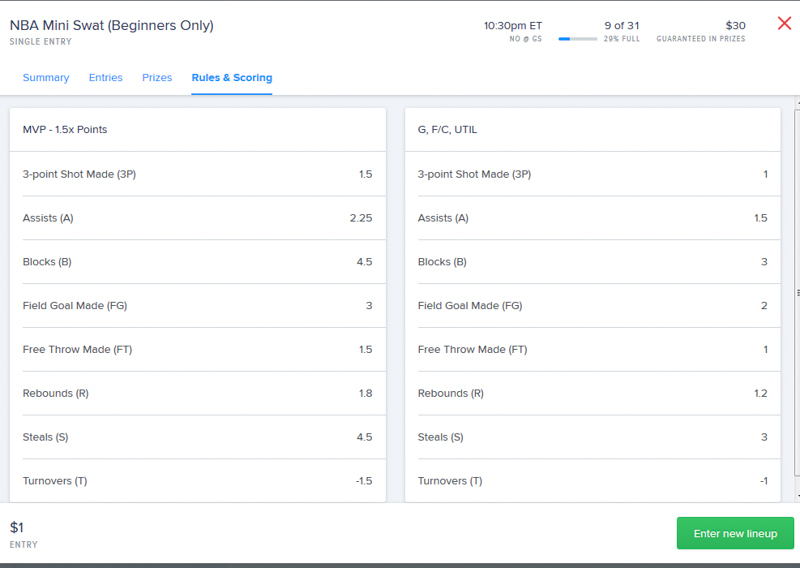 As a result, FanDuel has created games specifically made available to only Beginner and Intermediate players. 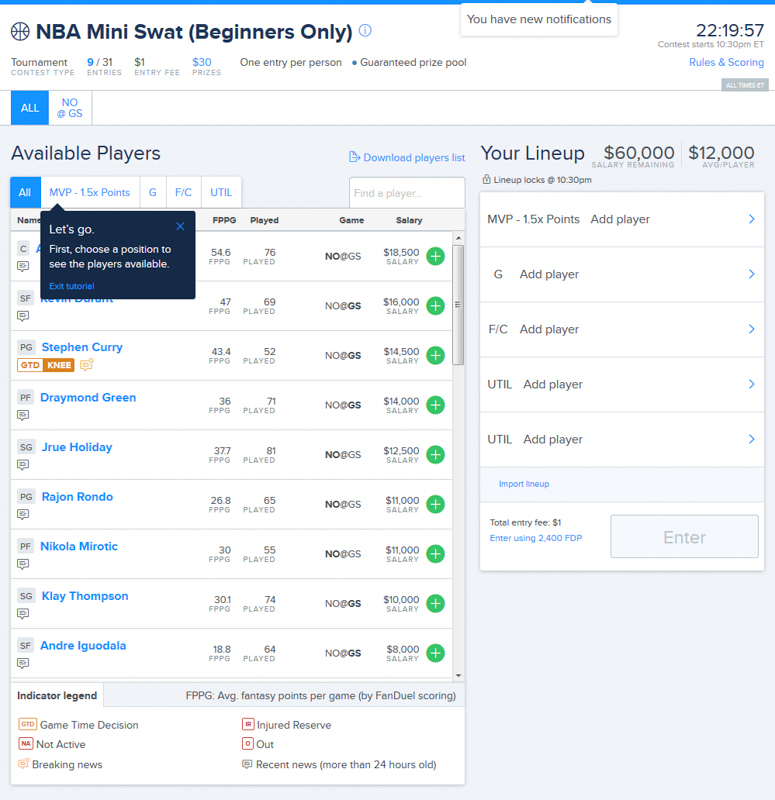 This gives Beginner and Intermediate players more confidence and allows them to enjoy their Beginner and Intermediate contests while they learn strategies for playing Daily Fantasy Sports at FanDuel. But if you are Beginner and Intermediate player you can still enter contests open to all player level. When you click on a contest, then click on “Entries” you can see the players who have already entered a team into the contest. When you look to the left of the name, you will see either No Badge (Beginner and Intermediate Players), Experienced Player Badge or a Highly Experienced Badge. This lets you know the level of player currently in a contest. You can use this knowledge as a strategy on which contests to enter. We will now go over the qualifications for player levels and how to get badges. This level is for new users. You will be a beginner for your first 50 contests. The exception to this, is if you qualify for the Experienced Players or the Highly Experienced Players Badge. While in Beginner level, you can enter contest only available to other Beginners. You can also enter all other public contests. To reach this level, a user must play more than 50 contests. A user will be an intermediate until they play more than 500 contests. The exception to this, is if you qualify for the Experienced Players or the Highly Experienced Players badge. To reach this level, a user can do one of two milestones. The first milestone is enter more than 500 contests in total. The second milestone is to win $2,500 in 6 or more contests. To reach this level, a user can do one of two milestones. The first milestone is enter more than 1,000 contests in total. The second milestone is to win $1,000 in 4 or more contests. Play Daily Fantasy Sports on FanDuel is simple. To get started, you will want to pick a sport you are comfortable knowledgeable in and follow closely. This make it easier for you to know which players will be good values on certain days. Next you will want to select a contest type. For beginners, the recommended contests are Beginner 50/50s, Beginner Double Ups and Beginner Tournaments. To make these Beginner games easier to find, there is a sub tab in each sport labeled “Beginner”. After you select the “Beginner” tab, you will see all available contests for Beginners. When you first start it may be overwhelming, but after a short time you will learn to filter to the type of contests you prefer. When you find a game you like you can preview the summary, game set, prize pool, scoring and current players entered. Summary will tell you the games available for the contest. This will be the pool of players you can choose from to complete your roster. You can use the detail from this preview to strategize on which contests are good to enter, especially as you enter contests that are open to everyone, including players that have earned “Experienced Player” and “Highly Experienced Player” Badges. Now that you have selected your contest. The next step is to fill out your roster. You will want to look at the positions you need to fill (varies per sport) and analyze how you want fill out your lineup. Your roster will be dictated by the Game Style. When you figure out that you want to fill out the roster for that contest. You can select the player the left to fill a position or tier. Once selected they know appear in that position or tier on the roster on the right. When you select your players, you will see the better the player the higher the cost. Also if a player is hot, their salaries adjusts from day to day. The same as if they are in slump their price tends to go down. Use these factor to determine bargain players. After you have filled out your entire roster, you can submit team to officially enter a contest. Your team is now entered to the contest. If you entered a paid contest, your entry fee will be deducted from your account. That’s all there is to enter your team for a contest. Now that you have entered a contest, the fun is just beginning. You can watch the game as you keep track of how players on your team are doing. Or if you are unable to watch, there is still the fun of checking the stats to see your points and ranking change. And if you employed the right strategy for that contest, you can end up winning a prize. Even if you don’t win today, you will gain the advantage of knowledge for future contests. If you’re on the go and not in front of a computer or laptop, FanDuel offers mobile apps for your iOS or Android devices. The FanDuel mobile app is easy to navigate and has all the full features of the website. The mobile app is one of the best things about playing Daily Fantasy Sports, as there often last minute sports news that may affect your team strategy. So when you get that sports news alert on your phone, no need to rush home to change your line-up before tip off. Just connect to the app and make changes. Whether you’re at home, work or on the go, FanDuel makes is fun and easy. 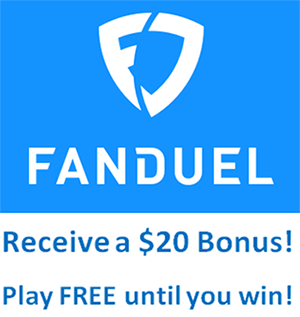 Sign up at FanDuel now and start winning today! Read another review of FanDuel at fantasyfootballer.org.